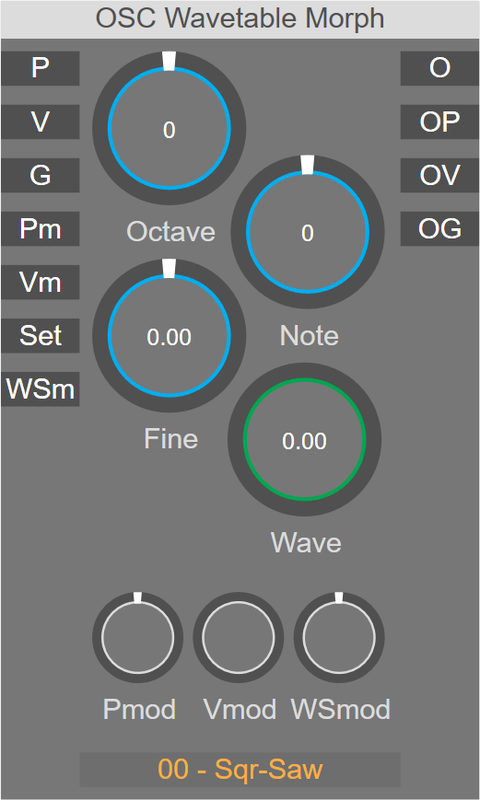 Outputs a band limited morphable wavetable waveform. The node is a bandlimited wavetable oscillator. The maximum amplitude of the waveform is set on the 'A' input, the minimum amplitude is the negative of the value of input 'A'. Frequency is set on the 'P' input in logarithmic pitch. The phase can be reset when the 'G' input has changes to a value that's different than 0. Set: Selects the wavetable set (only activates after a set is loaded into the memory). Wsmod: Wavetable selector modulation input.